When you’re a tunehead lifer, farming your musical terrain with a polycultural approach to sonic agriculture, it’s a reality — indeed a necessity — that certain strains of artists/genres/stylistic obsessions inevitably drop out of and then later resurface in my listening crop rotations. But, as I’ve previously noted, not all seasons’ harvests continue to yield again down through the years. While some evergreen produce re-seed and return stronger than ever, others wither and dine on the vine. 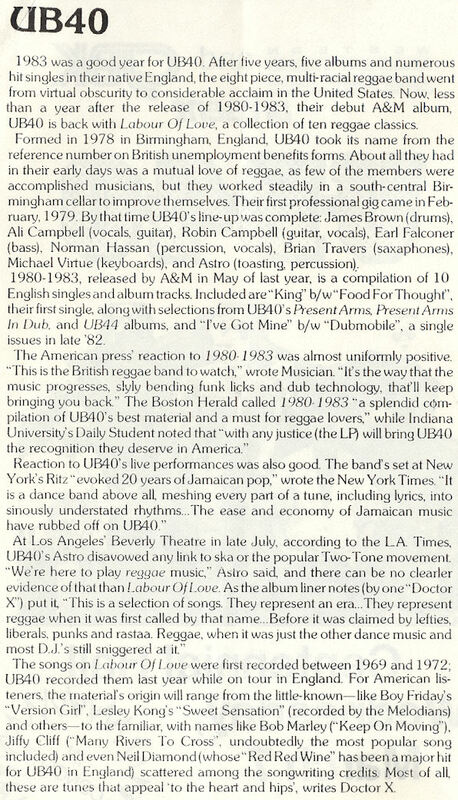 UB40 are one of those bands who sprouted regularly for me during the first half of the 80s, but have existed dormant under the soil of song since that time. This multi-racial UK reggae collective gradually took shape in their native Birmingham during 1978-79. They were another branch of a reggae-rooted tree that pushed overground in cusp-of-80s Britain, with notable offshoots such as the ska-revival 2-Tone groups (Specials, Madness, etc), post/punk rock reggae fans incorporating everything from roots to dub into their work (The Slits, The Clash, PiL, etc.) and the rise of distinctive homegrown reggae artists from dub poet Linton Kwesi Johnson to fellow-Brummies Steel Pulse. It all dovetailed into the independent release of their first single, making them a sensation in the UK right out of the gate. The double A side debut 45, “King” / “Food For Thought,” made the Top 10 there in early 1980, while their debut album, Signing Off, signed in straight at Number 2 later that year. The topical nature of the single set the tone: “King” dealt with the legacy of Martin Luther King while I always thought that “Food For Thought” was about Thatcher, with the whole Ivory Madonna thing (turns out it was about famine relief.) Regardless, they were largely Capital P “Political” in their early songwriting approach. The style and substance of Signing Off became a recording blueprint for their first few years as UB40 solidified their star status at home while making increasing splashes in different territories around the globe. So, how ironic that my favourite UB40 album at that time by far was the direction-shifting and decidedly apolitical vintage-reggae covers album, Labour of Love. Arriving in the early autumn of 1983 (at least here in Canada), Labour of Love was just that: a heartfelt tribute to the various reggae sides they had heard, loved, and danced to in their turn-of-1970s youth. Having the opportunity to play these songs that had been crucial for the members’ during their formative years for no other reason than the joy of it comes through loud and clear. The result was a more accessible and airier proposition for them. Love was both a critical and commercial success and a more fulsomely international one, particularly driven by the “Red, Red Wine” single. On a personal level, Labour of Love has a strong place-and-time association for me, dating to that fall, especially since it was one of the cassettes I took with me on my trip to NYC so as to have tunes to listen to on the way back with my anticipated Walkman purchase. It became a tape-spindle fave as winter’s chill took hold, as I spent plenty of time bundled up and walking about, breaking in the wondrous new portable stereo device. Both LP and 45 facilitated their breakthrough on this side of the pond, with this new flush of North American success meaning that they found themselves headlining a tour of concert hall-sized venues over here for the first time. 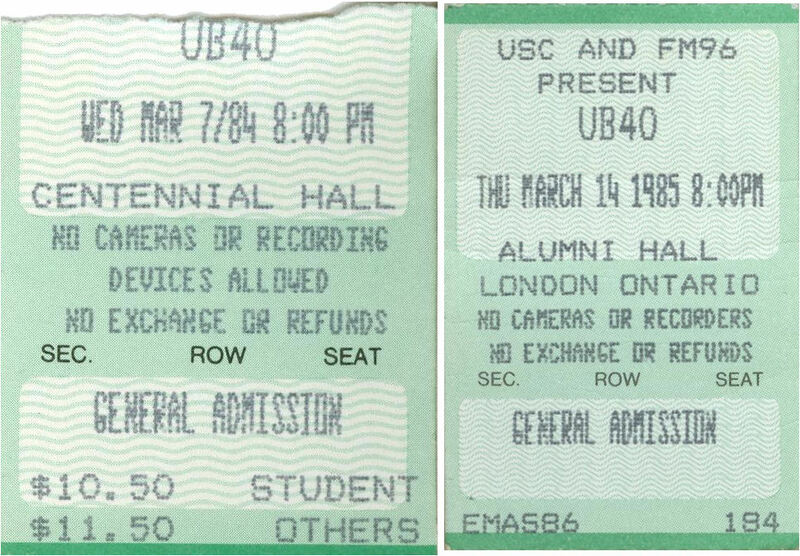 That tour brought them to my hometown of London, Ontario in March of 1984: great news for me and the many I knew. And when the night in question rolled around, there was a small sense of deja vu. Part of it was because it was two years to the month since I was last at Centennial Hall, seeing Orchestral Manoeuvres in the Dark. But the true deja vu of this March night was the venue being twinned a particular type of temperature: another bone-chilling late winter deep freeze. It was significantly worse this time around. And with our crew in and around the cusp of our too-cool-for-school 20s, there was No Way Sireee that we were going to be going out actually dressed properly for the elements. Fie that nonsense! However, unlike with the OMD gig and the audience of 800 or so of that evening, we didn’t have to undergo pre-show outside-venue captivity. Plus, the 2,000-or-so seater hall was packed this time around: all the better for us to more expediently defrost back down to good ol’98.6 among the heat-generating throngs. My program from the concert. We were a quartet on this evening, the four of us being my friends Lady Bump (who had also attended the OMD show with me) and Special Guests, new pal The Artist who I had met on the trip down to NYC four months earlier, and yours Various. In terms of the actual concert, I can’t retrieve much from the memory hard drive save three things: 1) the main floor of Centennial Hall was opened up and seatless, and we finagled our way up pretty close to the front; 2) I enjoyed the show and seemingly so did everyone else; and 3) “Red Red Wine” was one of the first songs played — a surprise as I was sure it would have been saved for later on in the night. What I do recall with considerable clarity is what happened after the gig. We ran into someone on the way out — the identity of said person now escapes me — who tipped us off that there would be an after-party for UB40 not far from the venue. So, with address in hand, the four of us speedily retreated back against the glacial winds to Special Guests’ apartment, just a few blocks away. We killed time at chez Special for an hour or so before once again braving the piercing frigidity, hoofing it down a few more blocks to the identified designation. It was one of London’s many magnificent Victorian homes in the residential section of the city’s core. It turned out to be a frat house, and a rather sprawling one at that. We arrived, knock-knocked on the door, and had it expediently confirmed that we were at the right place. Indeed, the small crew inside the frat were awaiting the 40s of UB, and we were invited in without knowing a sole there. Inside, scatterings of people were anticipating the band’s expected arrival. There had to be less than 20 persons at that point, the human sparseness accentuated by the size of the place: the house could have effortlessly held somewhere between 100-200 within its maze of floor rooms. All being fairly broke at the time and not having planned on going anywhere after, we had neither alcohol or weed, nor was any on offer. Ergo, we plopped our popsicled selves down on one of several sofas, growing increasingly bored with it all as time ticked away. After what seemed like an eternity, our gang of four deduced that the UB’s were not to be and decided to split. No sooner had we voted on pulling the plug than the band showed up. They and their entourage arrived somewhere between midnight and 1am, towed in by a CHRW DJ who I had listened to and recognized from sometimes hanging out at the station with M. Zeppelin as she did her weekly on-air stint. Even better, the band came crating in copious amounts of beer for all. The party instantly doubled in size and more, and things finally got rolling. Key band members were instantly ambushed and so I opted to hang back a bit for the moment, focusing initially on downing a few welcome brewskies to get a buzz going. 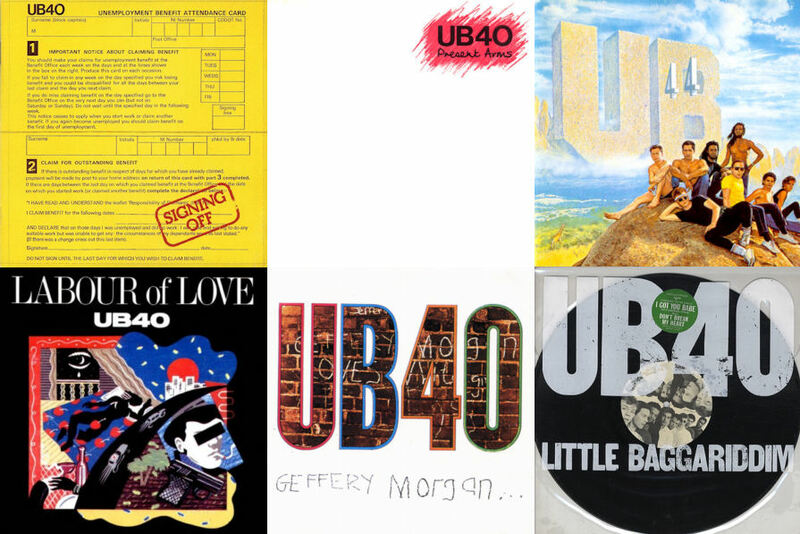 UB40 80-85: Signing Off (1980); Present Arms (1981); UB44 (1982); Labour of Love (1983); Geffery Morgan (1984); and the North American-issued Little Baggariddim EP (1985). The main floor of the house sported some serious, concert-hall-level speakers that had been pumping out mixed tapes of music. I had noticed cables from the speaker units that lead upstairs, and so about a half hour or so after the UB’s showing and with the house-dwellers guest-focused, I decided to stealthfully pop up there to see where the music was coming from. I did the usual feeble “Hi/Love The Band/Loved The Gig/etc” while Ali tried not to roll his eyes too hard. He was initially, and understandably, fairly reticent until I quickly steered the conversation in the direction of the topic most musicians warm to: music. This cable-destination room was clearly the place’s communal tune cave, housing stacks of stereo equipment with hundreds of records lining copious heaving shelves. Ali had been in the process of sifting through the vinyl library for selections to spin and was clutching a 12″ extended mix of Eartha Kitt’s then-red-hot comeback club hit, “Where Is My Man,” in his hands. We got talking about it and he spoke of being a fan of Kitt and the record. I had to admit being in the minority at the time in thinking that she and the track really didn’t work (I’ve since changed my mind) and we got into a friendly debate about it. Perhaps because I wasn’t being overly sycophantish, he warmed up to chatting while continuing to sift through the collection rather than ducking out. Then there was what was in his other hand. Or possibly, potentially, in his other hand. It might have been — not saying it was, not saying that I could be absolutely sure — but he may just have been holding a large, thick, juicy reefer. And if he were to have been holding a jumbo joint, there’s a likelihood that he might have waited and chatted with me for a while before lighting it up. And if he perchance did that, I’m willing to guess that he may have lit it and inhaled about a third of it in between continuing to size me up amid the music-speak before deciding to offer me some and start passing it back and force. And if that had happened, we most likely would have afterwards resumed flicking through the rows of albums, pulling several out that sparked conversations while a I’m-betting-it-woulda-been-damn-swell mighty buzz set in. So here I am chatting with Ali Campbell as he disperses music-related opinions and stories for about 20 minutes or so. From that conversation, I distinctly remember the following three highlights. First, he started enthusing about Michael Jackson. Campbell mentioned that he was the same age as Michael and that he’d been a big fan of the single-sequenced gloved one — then at the absolute zenith of Thriller-mania — since he was a kid and the Jackson 5 first burst on the scene. Second, he began talking about the early days of the band and their first gigs when they came down to London. They had met and befriended a pre-super-fame Adam Ant (he and UB40 later exploded in the UK at roughly the same time in 1980, albeit via decidedly different music styles and audiences) and it was Prince Charming himself who offered up the floors of his place for a broke, nascent UB40 to crash on during their first trips to the capital. The one Stevie track he didn’t like? Wait for it … “Master Blaster.” I thought that was a bit rich. At some point in all this, Special Guests wandered in. He’d wondered where I had disappeared to and, upon his entrance, I could see that Campbell was thinking that the room was getting too crowded but chilled a bit upon realizing it was a pal of mine. Special G jumped in with the tune hunting and talk, but soon thereafter the word was out and the room was besieged by others who had noticed Mr. Lead Singer was MIA. And with the mob filling the room, we exited and returned downstairs. Ali Campbell listening favourites circa 1984: Eartha Kitt, and Stevie Wonder, and Michael Jackson. Our quartet carried on partying into the wee hours, eventually zooming back to Special’s tiny apartment where we all crammed on the sleepable areas until the morning sun arose and we could all bus home. I’ve already written about how exuding hangability’n’chumminess isn’t an important criteria regarding the artists I listen to. Ultimately, it’s about the music, the art, my response and the resonance rather than the personalty (even if I freely admit to being a behind-the-scenes-stories/true-gossip junkie and reader of copious biographies of artists I love and the drama in/of their lives). That said, it’s of course pretty cool when the artist turns out to be non-assholes. And my impression of Ali Campbell from that whopping 20-30 minutes is that he was a good guy: a sorted, down-to earth fella. I do recall getting to the very front of the stage as I had with Joe Jackson. But that aside, I can’t remember anything about Round 2. I’d picked up Geffery Morgan which I was lukewarm on, as was the case with the Little Baggariddim EP later in ‘85. 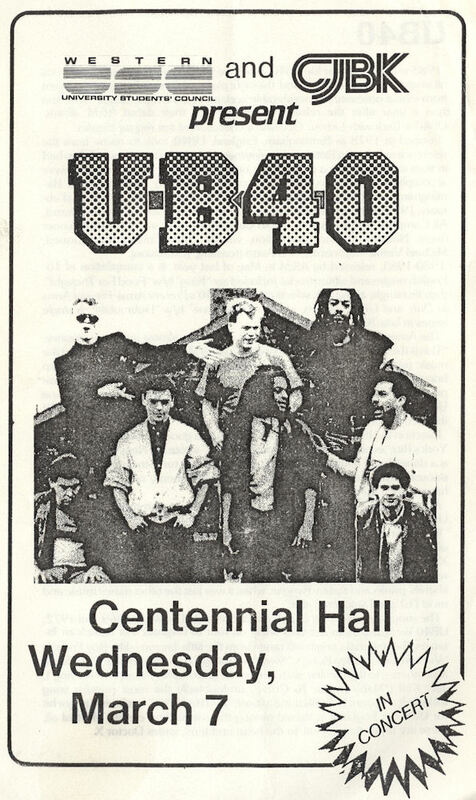 After that, UB40 pretty much fled from my radar and I was never much interested by their post-mid-80s work. It garnered them some big hits around the globe and I heard plenty of those albums as it was during my record retail years, but none of them resonated with me. As for the group’s career, they had a hell of a professional run right through the 90s with worldwide success. Alas, a disgruntled Ali split from the band in 2008 and there’s since been further splintering within the group in the last decade. It happens. Meanwhile, I’m sure Ali is still spinning Michael Jackson and Stevie Wonder at home. I’m still playing them too. And Eartha. “If It Happens Again” (from Geffery Morgan 1984) … “I’m leaving,” and so the lyric goes. It’s about Thatcher and the mid-80s election but Ali Campbell could have been singing about down-the-road UB40: “it” must have as he did. VA, this interesting story made my day! What a great group of experiences to have remembered so well and what great music from that point in time. It also reminded me of what I was doing in both ’84 and ’85…in addition, it was Feb. ’87 when I got to London for the first time, but took in theater and didn’t see any concerts. Interesting to see the role that Chrissie Hynde played early on with UB40’s becoming more known and successful. designanator: It was a fun night out, particularly as I got to have that one-on-one conversation with Ali Campbell. He still had such enthusiasm and love for his favourite music, didn’t seem jaded at all. lschmoopie: The programs now seem so hokey but they’re great to have. As for the redredwinebar … ah, synchronicity. Great to see you back here. Linda: Them naming themselves after the unemployment form also ties in with the first album being called “Signing Off” as they were now able to do so with a viable career. Another great review Various. I hadn’t heard Food For Thought before and it’s pretty good. I remember really liking Our Own Song which I think came out a bit later in the 80s. Not liking Master Blaster?!?!? What is not to like? It has one of the catchiest rhythms ever and is on my short list of Stevie’s greatest. Abra: I brought “Sing Our Own Song” up on YouTube and it instantly came back to me. I’d forgotten that I’d once owned it’s parent album, Rat In The Kitchen, but sold it years ago. It’s not bad but, again, I’d like to take the brilliance down on the production a few notches. For me, it kind of torpedoes this type of material. With “Master Blaster,” I think Campbell was intimating that he didn’t like Stevie’s take on reggae. The irony for me is that I’d put it in the same stylistic camp as a lot of UB40. Regardless, Stevie truly had an imperial run which cannot be denied, even if most of his post Hotter Than July stuff is naff. I’d love to see him come back and do something truly killer but I’m not holding my breath. Mind you, Dylan and Bowie have turned out some excellent work this century after a couple of decades of (mostly) rubbish, so anything is possible. Been offline for a couple of days, VA, so apologies for being tardy. Centennial Hall. Sheesh. Last time I was there was to write a review of Ike and Tina for the Gazoo. At least, I think it was my review they used. Or maybe it was to see Lightfoot. 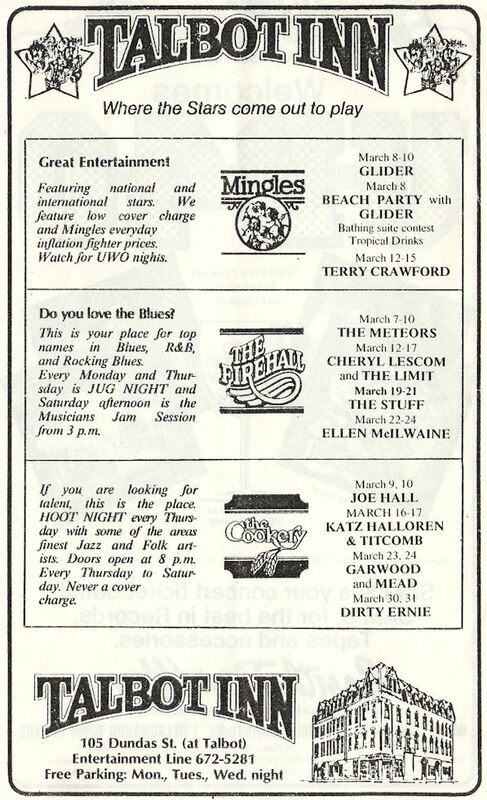 My memories are … um … hazy about that era. Bet that Victorian house was somewhere right near Victoria Park and across from the “Holy Roller”. Anyway, yeah — UB40. Read about them at the time, and how they got their name. Of course, we have “Red, Red Wine” somewhere in the collection, and trot it out from time to time. I liked some pretty odd (to many of my friends) artists back then, including Eddy Grant. “Electric Avenue” remains a fave. Bo: The house was a few blocks NE of Centennial Hall. I tried to identify it on Google Maps but couldn’t be sure. But it’s somewhere over there in that residential section. I never knew Ike & Tina had played there. How was the show if any memories can be garnered? Not sure what you mean by the “Holy Roller”? Is that perchance a nickname for St. Peter’s Basilica at the tip of Victoria Park? 1. 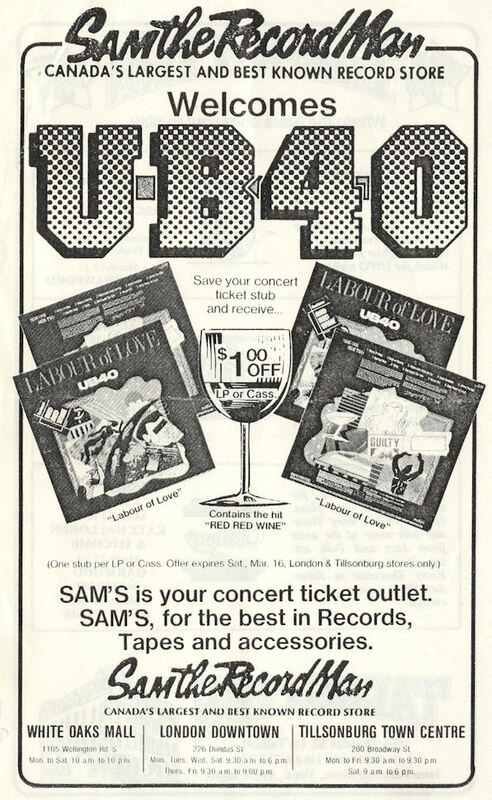 I never gave UB40 much thought beyond Red Red Wine, Cherry Oh Baby and the Chrissie Hynde duet. I thought they were rather fluffy and pretty, and, well, white. Because the other band members didn’t get much screen time in the music videos (to my fading memory). So thanks for this. 2. Check out Ali’s saucy manspreading on the UB44 cover painting. And the headband…..
3. I friggin love that Eartha Kitt single. Here in the U.S. we have this monstrosity called The Real Housewives of New York City. One of the titular Housewives recorded an autotuned single, “Money Can’t Buy You Class” which is a cheap, inbred mutant third cousin to “Where is My Man”. 4. Holy crap, that Dr. Frank-n-furter/Siouxsie look on Adam! I love me some Adam Ant for sure. But I’m glad he went for the pirate garb. Cannot wait for the Siouxsie post! Oh, and I’m binge reading Kim Gordon’s “Girl in a Band”. Shall we do dueting posts on it? catch-22: The old school reggae records really are the ultimate at successfully blending mellow and intense. And when you turn it up, it’s the sensory, throbbing bass that hits the sweet spot. Ditto for a lot of classic jazz bass playing. And Jah Wobble. Unconscious, body-tones. Chiller: I don’t usually like elbowing my way into chats with musicians or well known creative people, but if the occasion arises to simply have a conversation, that can be great. I used to interview a number of artists for print and radio and I always felt the best interviews were when the formality ended and it simply turned into two (or more) people having a conversation. 2. That’s not Ali manspreading and be-headbanded. 3. We get all of those Housewives shows up here to but I avoid them like Shingles. 4. Yes, it was early Adam, not yet figured out. I think he looks very Clockwork Orange meets Phantom of the Paradise. 5. I just finished “Girl In a Band” earlier this evening. Loved it, although a sad ending on several fronts. I interviewed Kim Gordon in 1992 and she couldn’t have been nicer. Smart and very interesting. You’re on about the post. Will contact you. Really enjoyed hanging out with this one. Hooked immediately by the farm metaphor, and how cool that you got to talk shop with the lead singer. I have Labour of Love, and will play it tomorrow (too late tonite). The pic of Adam Ant–wow! Not so goody two shoes there. As I have done with some other “tribute” albums of note, I’d love to put together a playlist of the originals on “Labour of Love” in sequence. I have about half but I’m sure I could iTunes the rest. And yes, a embryonic look for M. Ant. in that photo. Sort of somewhere in between “A Clockwork Orange” and “Phantom of the Paradise.” Or perhaps trying to be the male Siouxsie. VA, Happy St. Patrick’s Day! Looking forward to your next post here! Happy St. Pat’s to you too and great to see you over here. I will indeed be continuing with the series here on this blog.